Theodor de Bry (1528-1598) was an engraver who became well-known for his illustrations accompanying reports of travel to America, Africa, and Asia. De Bry’s copperplate engravings were the first comprehensive collection of images depicting the overseas world. As such, they fed a public hungry for images of exotic lands and peoples. De Bry himself had never travelled overseas, so his naturalistic illustrations were often far from accurate. Many of the figures have decidedly European appearances, and cultural artifacts are often invented and combined in fanciful ways. Nevertheless, because they were high-quality illustrations that could be easily reproduced–as they were up through the eighteenth century–they played a very important role in shaping Germans’ and Europeans’ perceptions of distant lands. Indeed, they were far more important than the texts they illustrated. The images below are two of fourteen copperplate engravings de Bry produced in 1598 to accompany a Portuguese slave trader’s account of his visit to the Congo, as told to the Italian writer Filippo Pigafetta. On the one hand, the images show the development of an ethnographic mode of viewing unfamiliar peoples, engcouraging viewers to viewers to categorize subjects through a focus on outward physical features, clothing (often, the lack thereof), hairstyles, artifacts, and customs, especially those surrounding religion, war, and eating. On the other hand, they propagate fantastical stories that Europeans wanted to see confirmed by real travelers. 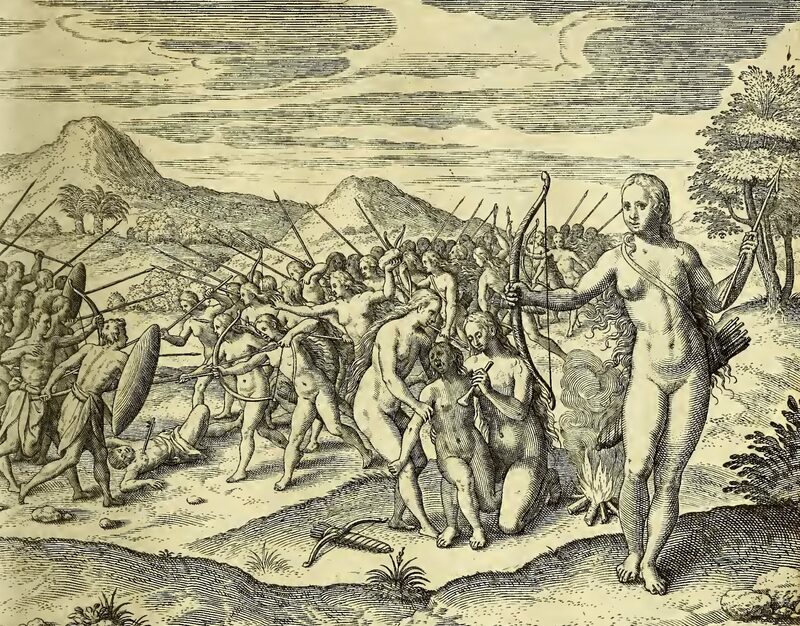 The first illustration depicts the cannibalistic Anziquians, who, we learn in the German edition, have “slaughterhouses for human flesh like we have slaughterhouses for cattle, sheep, and other meat.” The second shows a tribe of naked Amazonians charging into battle against male warriors while, in the foreground, a woman is inducted into the tribe by having her left breast shaved off. Source: Filippo Pigafetta et al., Regnum Congo hoc est Vera descriptio regni Africani… (Frankfurt, 1598). 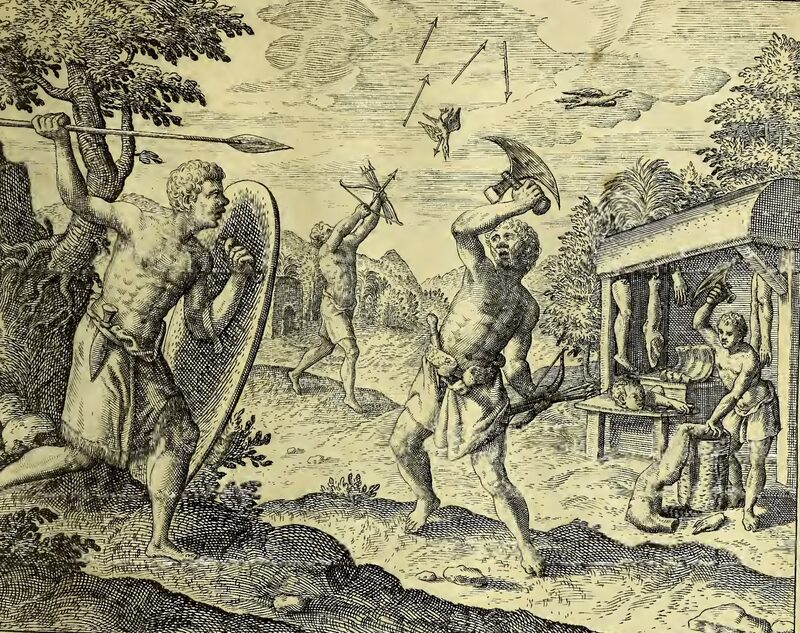 Cannibals and Amazons in the Congo (1598) by Jeff Bowersox is licensed under a Creative Commons Attribution-ShareAlike 4.0 International License.